NO_NAME is a looping video work produced for the curated project 'Deadpan Exchange VIII'. Seven artists from the UK were invited to produce artworks in response to the work of seven Lithuanian artists, the resulting works being exhibited in a venue in Mexico, where further artistic responses would be curated into a new exhibition. NO_NAME was produced in response to the video work 'Suspended in the Air' by Laura Stasiulyte. The piece consists of a looped digital capture of paused analogue video footage of a military helicopter. 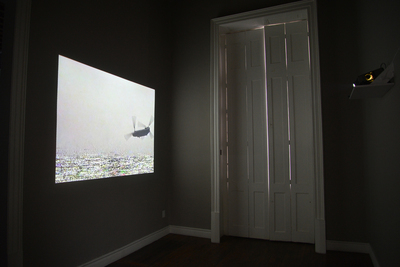 The flickering artefacts from the pausing of the video are visible on the digital capture, even though the action is at a halt. Apart from the literal sense of something being suspended in the air – the helicopter – the piece also plays with the suspension of time and of meaning. The flickering still unfolds even though the image is not moving, setting up a strange kind of non-motion, a permanent wait for narrative resolution. The image of a military helicopter is also threatening and in the context of military secrecy begs the question of what happened before or after this particular frame, or what can and cannot be shown.